I tried first experiment with eaty-beaty receiver but something got problematic and could not cure it in time so lost interest and attempted this receiver. have a look. My LM386 did not work ? I replaced atleast three new LM386. Was wondering what is happening. Ohh it might be Chinese dump. So took few transistors. made complimentary pair small Audio amplifier. It works nice. 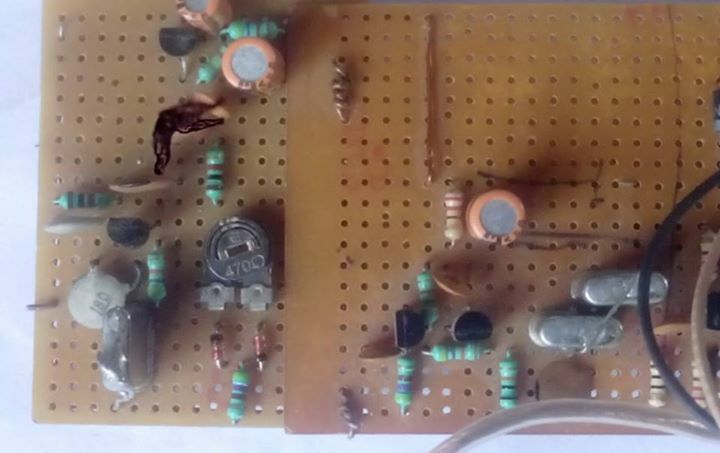 this is my first AF Audio amplifier made from all discrete components. It was just 20 minutes affair and worked at first time. But, power is low. Need to reduce the 470 ohm resistor. But, that reduced the audio. So, it is good as it is. I used whatever components I had. Nothing special. 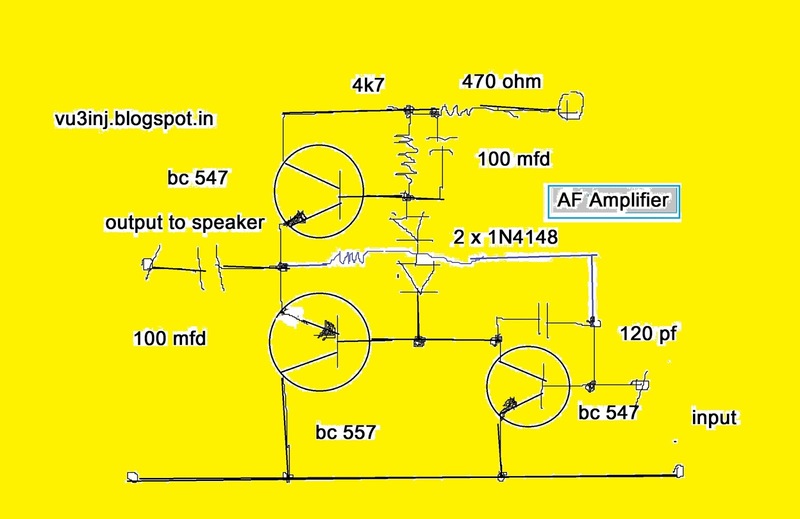 only transistor AF amplifier. I feel it need some more audio gain in pre-amp. 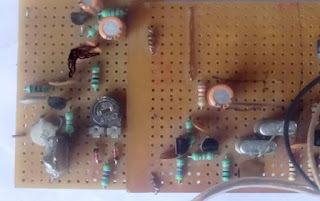 I increased the gain in front end RF amplifier. 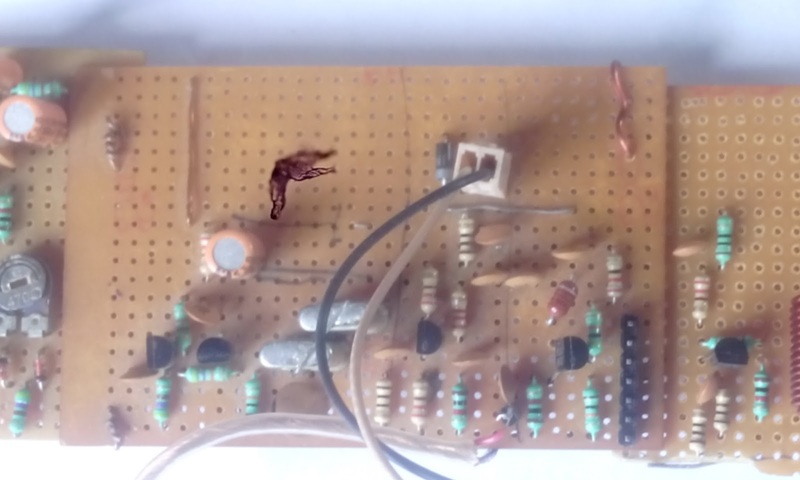 By shorting the 10 ohm degenerative capacitor. Oh boy it increased sensitivity. The coils are made on standard 8mm drill bit. So, it can be reproduced anywhere all over the world. When I used 21 turns with 100pf it resonated around 10 mhz. Then empirically, reduced few turns one or two at a time and changed the pf to 68pf at one point it resonated. Finally at around 15 turns it gave resonance in 20 meter band. 14.200 mhz. That's okey. Same way done the second tank. Then linked them with 10 pf. That will give me enough bandwidth. 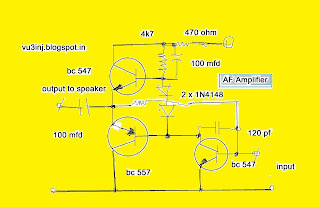 The If amplifier is simple two stage amplifier. I did not use the LC tanks. Due to non-availability of toroids/tuned cores etc. 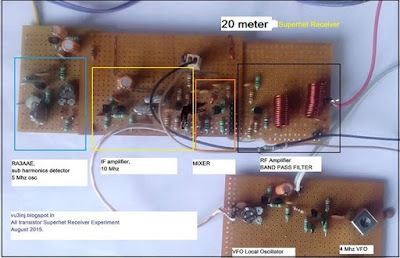 So, simple resistor coupled amplifier are used. First Amp is classical class A with negative feed back. Used BC547b. Second IF Amp is a cascade one. Using two transistors BC547b+BC547b. The xtal filter. I was little skeptical at first. The xtals were matched. See previous posts for xtal filter making. Its purely experimental. I have no instruments to measure the bandwidth etc. I am not puritan. Whatever works is mine. So, this somewhat wide but okey for me. Only caution I took is short leads and clear soldering. Don't forget to ground the metal case. No extra shielding is needed. The filter is the "secret" of RC coupled amplifier. Generally I use the Collpit oscillator, Emmiter follower design. 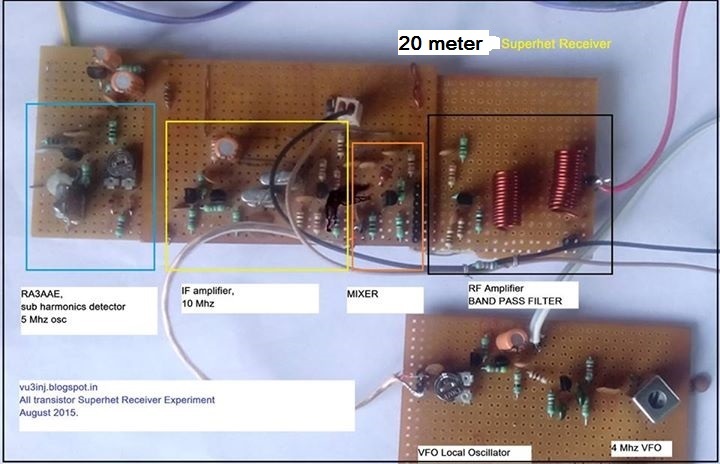 for base bias 100k resistor and at emitter 1k was used. But, this time I used some different biasing method. A fixed base biased was used. 22k+33k. good result. I used old trusted buffer with 470 ohm preset to control the RF going to mixer. This way I can somewhat control the mixer characteristics. Its stable. But, I have not measured its stability. Will put some slow tuning and box it up. Will use regulated 5 volt . LM7805. RA3AAE, sub-harmonics detector. See previous posts about it. Here is the ckt diagram of IF stage and detector. For further reading about these module just read my previous post. or email me. I will respond. 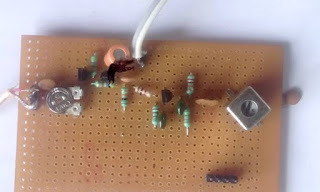 I will try to make one transistor audio filter. will make compatible 20watt cw transmitters using 4194 kc, 4286kc & VFO so I can be atleast heard by other hams. Once this is done, my "on air dream" is over. Will try to modify it to DSB or SSB and will be end of days for 20 meter. And if by chance I get hold of DDS VFO, it will be good.